Most of what I write stems from what I am reading. When I’m feeling particularly unintelligent and uninspired I spend the majority of my time browsing websites like Buzzfeed, a site devoted to teaching America’s youth to seek out internet fame, where they will be upvoted and lol-ed at until their funny vine is treated with contempt as “last year’s meme”. 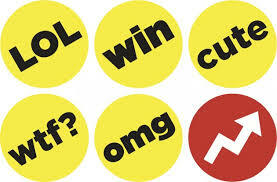 Buzzfeed: because a few moving pictures and some cliche captions pass for an article. This entry was posted in Opinion and tagged blogging, books, gaining viewers, humor, journalism, posting, posts, readers, readership, reading, stefan sagmeister, stories, storytellers, storytelling, tagging, wordpress, writing on July 30, 2014 by thinkingdiagonally.